The annual Himalmedia Public Opinion Survey this year also carried out a special poll in 14 districts to gauge the impact of the earthquake and relief work. The results have reinforced the perception that the state’s response to the April-May earthquakes has been slow and inadequate. Nearly four months on most earthquake survivors are still in temporary shelters and have not started rebuilding their damaged houses because of the delay in formation of the National Reconstruction Authority. Most of them also still need emergency food and relief for another year. Only 2.8% of the earthquake survivors polled earlier this month said they did not wait for the government’s support and have rebuilt houses on their own. An additional 33.2 % said they repaired their damaged houses and are now living there. But 54.4 % survivors said they are still in temporary shelters and waiting for the government’s support. Some survivors are in tents (2.6%), relatives’ houses (2.4%) and rented rooms (3.5%). The government finally appointed the National Planning Commission’s Govinda Raj Pokhrel as the CEO of the Reconstruction Authority. He will need time to prepare a framework and guidelines for the distribution of the reconstruction grant. That may take till October at least. The Survey showed that housing (69%), food (43%) and children’s education (36.2%) are the top three problems facing the earthquake survivors. Shelter is an even more pressing problem in worst-hit districts like Sindhupalchok (94.2%), Dhading (94.6%) and Nuwakot (96.5%) with less of an issue in Solukhumbu (65.4%) and Khotang (60%). Only 9.3% respondents in this sub-survey of the Himalmedia Opinion Poll said they received relief within the first week. Nearly half the respondents (49.2%) said they received relief much later. And 34.9% respondents complained that they had got nothing at all. Nearly one in every two survivors (45.2%) felt discriminated against in distribution of relief supplies. Affiliation with political parties (54.5%), connection with parties, leaders or government offices (50.9%) and economic status (46.1%) were perceived as the top three reasons for discrimination. Caste or ethnicity ranked fourth at 15.9%. Despite this, most survivors say they will need relief aid into the future, with a third or more saying they will need help for another year. Survivors wanting relief for three months and six months were 16.9% and 26% respectively, while only 14.2% said they no longer need help. 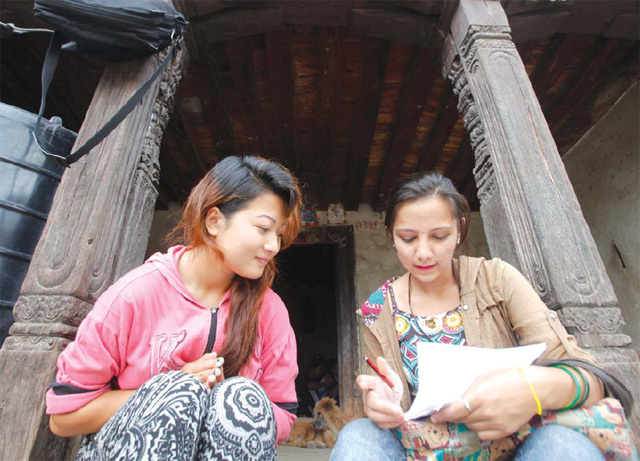 The NPC’s Reconstruction Policy emphasises rehabilitation of the earthquake survivors in their own villages. But more than half the survivors say they want to be relocated in safer areas. Only 38% said they want to remain where they are. The survey has also unearthed an interesting aspect of social harmony. After the earthquake, the government was flayed for its painfully inadequate response but security forces were hailed for their prompt rescue operations. But the survey shows it was the neighbours who played the most important role in rescue. Of the all respondents who were rescued alive, 53.7% said they would have died had it not been for their neighbours digging them out. Similarly, 35.2% said they were rescued by their own family members. Only 11.1% said they were rescued by the security forces.